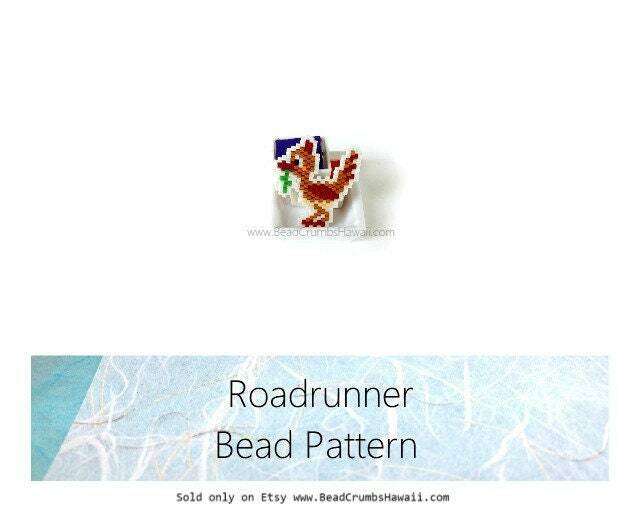 Make this desert chic Roadrunner beaded charm with the pattern provided in this listing. This is being offered to you in a one page PDF document that you will need to download/print. Beading Method: Brick or Peyote. The pattern is created on a Peyote chart but by turning it sideways, you can complete the design in the brick stitch method. I completed the sample using the brick stitch technique. Please see listing photo of sample PDF pattern file. No word chart is provided. 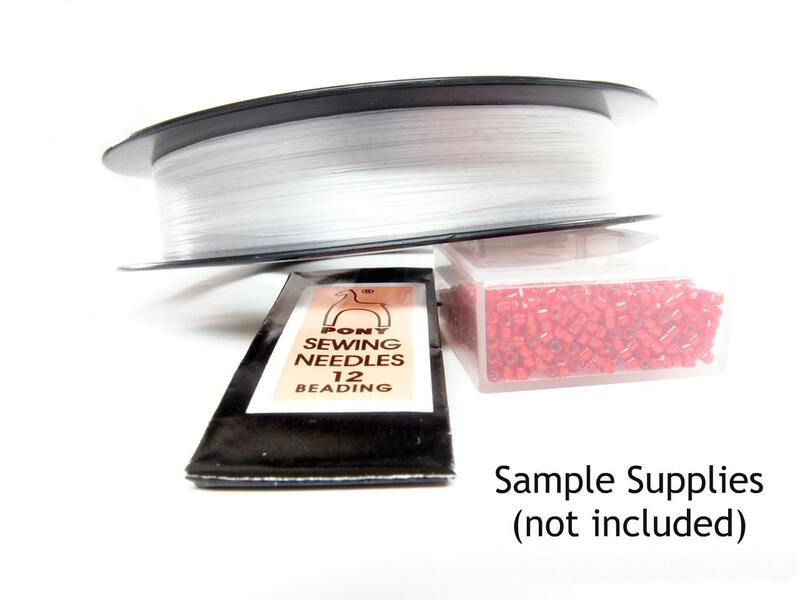 All of these materials may be substituted but the final product may differ from the sample. Feel free to change the bead colors. How do I download a digital item I purchased? 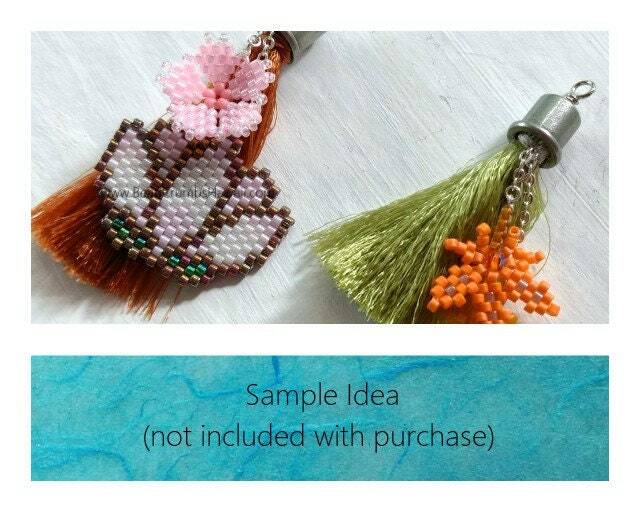 ➤ NOTE: Some buyers are unable to access the files through the Etsy app. Please use a laptop/desktop device to download your files. Feel free to contact me if you are having trouble. ➤ If you want to purchase a printed copy of the pattern, please contact me. Additional printing/shipping costs will apply. Are you thinking about selling the finished beadwork you made from my patterns? Please click on my "Pattern Usage" link below for more information or contact me via Etsy Conversation. Bead Crumbs patterns are my original designs and copyright protected. All rights reserved. You are not allowed to share, sell, copy, teach my patterns. Please click the "Policies" tab or view the "Pattern Usage" link for more information. This page informs you of my policies regarding the collection, use, and disclosure of information when you use my Service through Etsy or its related sites. I have no control over and assume no responsibility for the content, privacy policies or practices of any third party sites or services. What does your pattern include? You are purchasing a DIGITAL PATTERN for you to download &/or print. You will need a digital reader to access the file. Please inquire if you want a pattern printed and mailed to you. Printing & shipping fees will apply. *Bead Legend - includes bead colors with reference to manufacturer's bead no. and bead count. *Photo of a completed project so you can see an actual finished piece. 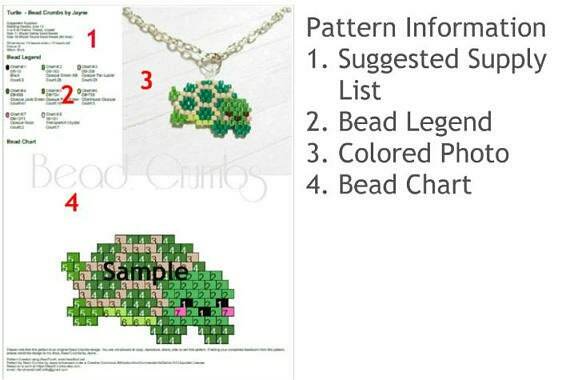 *Bead Chart - graphical image of bead placement. The numbers on the bead chart corresponds with the numbers shown on the bead legend. Patterns DO NOT include instructions unless stated in the description. Do I need to know how to bead weave when I purchase a pattern? Yes. You will need to know basic bead weaving stitches such as ladder stitch, peyote stitch and brick stitch. You will also need to know how to add thread (if your existing thread is too short), how to end your beadwork and how to add attachments or connector beads if making jewelry. If needed, I will try my best to help you along by providing you with tips and video links. Please take time to view this youtube link if you are new to beadweaving, bit.ly/learnbrickstitch. Your listing states "Peyote" (or Brick Stitch) bead pattern. 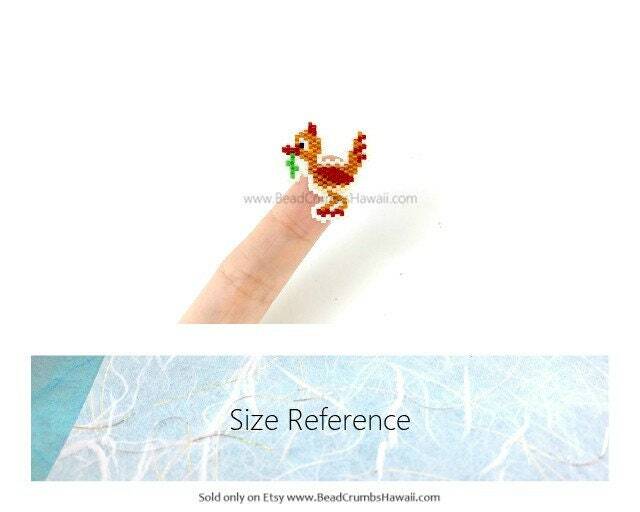 Do I need to stitch my beadwork using the particular method stated? Definitely not! Use either Peyote or Brick Stitch to weave your design. Many of my patterns are created on a Peyote Stitch chart because it's my personal preference. However, when actually beading my piece, I turn my pattern sideways and stitch using the brick stitch technique. Why don't you show a "starting point" on your patterns? You can start anywhere you want to. Some people have told me that they like to start from the center moving outwards while others like to start at the edge. I usually start at the widest/tallest point or on the row/column that I plan to attach a connector bead (so I can get that out of the way first). Why do some of your patterns have loops for hardware while others do not? It is a personal preference (as of Sept. 2015, new patterns will not show the finishing loop info). Instead of a loop, I like to stitch on a closed jump ring. Can I sell my beadwork made from your pattern? 3. Do not imply or claim my original design as your own. I would appreciate credit for the use of my designs. Please link to my shop, www.BeadCrumbsHawaii.com, when you sell &/or publish your work (online/offline) On social media, please tag me on the following accounts. Can I reproduce your pattern? You are not allowed to copy or recreate my design off of a photo or a finished piece that you have viewed or received. You must purchase my pattern. What if I see a mistake on your pattern? Please contact me for a refund and updated pattern.